Location: PGE National Stadium, Al. Ks. J. Poniatowskiego 1 Street, gate number 5 and 6 (Praga). 10 playing areas with attractions for kids (eg. inflatable playground) – children help elves to create a Santa Claus Elixir, at the end, they meet Santa. Online tickets. Website in Polish. The Elf Factory runs until December 22, 2018. Location: ‘Królikarnia Cafe’ located in the Królikarnia Museum of Sculpture, Puławska 113a Street (Mokotów), 4 pm – 7 pm, tickets 10 PLN, send an email to book a spot: krolikarnia@artbookstore.pl. Facebook event in Polish. Location: Warsaw Old Town, the Warsaw Barbican area, next to the Castel Square (Plac Zamkowy), 11 am – 9.30 pm. 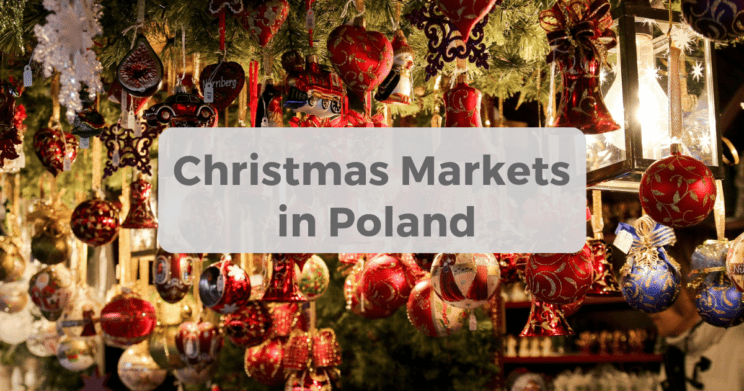 Souvenirs, gifts, local crafts and food like pierogi, hot chocolate or… ice-cream. Facebook event in Polish. The Market runs until January 6, 2018. Location: Wilanów Garden, Stanisława Kostki Potockiego 10/16 Street, 4 pm – 9 pm. It can be crowded during weekends, buy tickets online to skip the line. Mappings (illumination, picture, and sound) on the Palace façade: Friday, Saturday, Sunday: 5.30 pm, 6.30 pm, 7.30 pm. Click here to read our tips in English on visiting the Wilanów Palace and Park, including “The Royal Garden of Lights”. The festival runs until February 24, 2019. Location: Music Hub Academy, Al. 3 Maja 5b Street (Powiśle), Melofun (dedicated to children aged 3-4, 55 PLN per class), 1 pm – 1.45 pm; Intro Band (dedicated to children aged 5-6, 65 PLN per class), 12 pm – 12.55 pm; Band (dedicated to children aged 7-11, 95 PLN per class), 2 pm – 3.30 pm. Send an email in English or Polish to sign up: kontakt@musichub.pl. Click here to learn more about Music Hub music classes for children in Powiśle and Wilanów. Location: The English Playhouse’s new location in Syta 78 Street (Wilanów/Zawady), 10 am – 1 pm. Hand-made crafts and decorations, Christmas cards, jewelry, wreaths, English books for children, preserves made by The English Playhouse students. Attractions for children include Santa grotto, face painting, soft-play area, arts & crafts table, gingerbread workshop. Facebook event in English. The lights will be switched on gradually throughout Warsaw starting from dusk, from around 3.30 pm. The main attractions will focus on “The Royal Route” – Castle Square/Plac Zamkowy (including the Christmas tree), Krakowskie Przedmieście Street, Nowy Świat Street, Trzech Krzyży Square, Aleje Ujazdowskie Street to Belweder next to the Royal Łazienki Garden. Other locations include The Old Town, Aleje Jerozolimskie Street (from Warszawa Centralna Railway Station to Rondo Waszyngtona Roundabout and Poniatowskiego Bridge), Mokotowska Street, Bankowy Square, Marszałkowska Street (from Królewska Street to Konstytucji Square), Świętokrzyska Street (from ONZ Roundabout to Marszałkowska Street), Targowa Street, Solidarności Street (from Bankowy Square to Wileński Square, including Śląsko-Dąbrowski Bridge). New locations this year include Miodowa Street and Plac Krasińskich. Facebook event in Polish. Location: Skwer Dywizji Pancernej (the area between the Old Town and Vistula), free entrance. Starting from December 8, the holiday illuminations at the Fountain Park will be on every day from 3 pm. 15-minutes shows with music: 4 pm, 5 pm, 6 pm, 7 pm, 8 pm. More in English. Location: Plac / Square Narutowicza. Free entrance, 5 pm. The event includes a concert. Facebook event in Polish. Location: Walecznych Street (Saska Kępa), free entrance, 6 pm – 7.30 pm. The event includes a concert of Christmas songs and carols. Facebook event in Polish. Location: Krakowskie Przedmieście 66 Street, close to St. Anne’s Church. Free entrance, 12 pm – 7 pm. 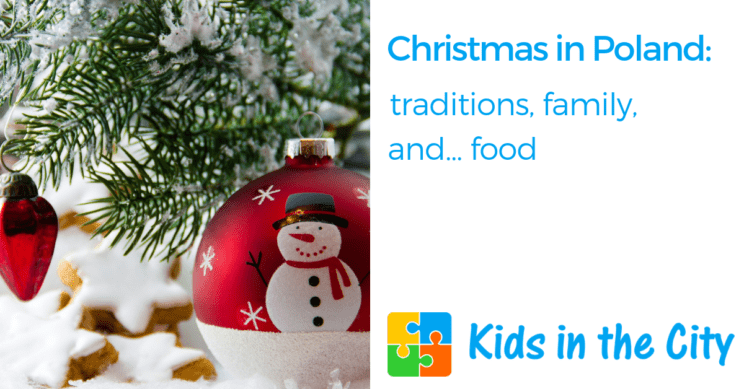 Workshops – decorating Christmas gingerbread cookies. Sending Christmas cards presenting Warsaw in a Christmas image (cards and stamps will be available for free, there will be also available a special seal – your postcards can be sent right away). Children will have a chance to meet Santa and elves and take photos with them. Facebook event in Polish. The Christmas tent will be open on the following Saturdays and Sundays: December 8-9, 15-16. Location: the ice skating rink in the Old Town Square (city center), free entrance, 6 pm – 7 pm. Attractions include the show of figure skating, competitions, and ice disco. Facebook event in Polish. 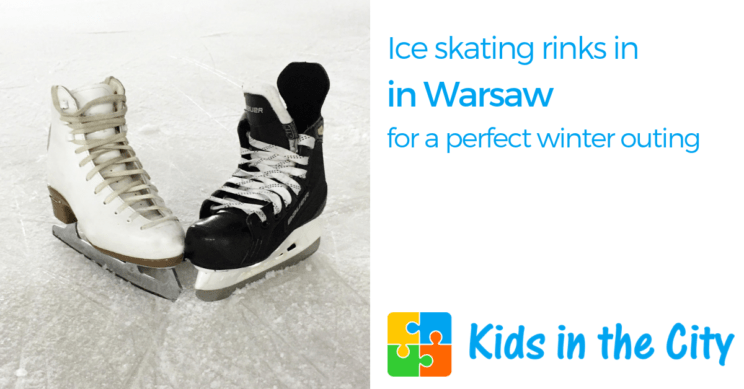 Click here to check out our post about ice skating rinks in Warsaw. Location: Plac / Square Europejski (Wola), 4 pm – 9 pm, free entrance. Attractions include a Venetian carousel, winter train for children, games with the Snow Queen, food trucks. Facebook event in Polish. The event runs also on Sunday. Location: Tarabuk bookstore, Palace of Culture and Science (entrance from Świętokrzyska Street, the same as the entrance to Lalka Puppet Theater), 12.30 pm – 1.30 pm, free entrance, registration required (tarabuk@tarabuk.pl). Facebook event in Polish. Location: the area next to Arkadia shopping center, al. Jana Pawła II 82 Street, free entrance, 3 pm – 8 pm. Attractions include Santa’s grotto, a virtual ride on Santa’s sleigh. Facebook event in Polish. Location: ‘Teatr 6. Piętro’, a theater at the Palace of Culture, entrance from Marszałkowska Street, free entrance, 11 am – 4 pm. 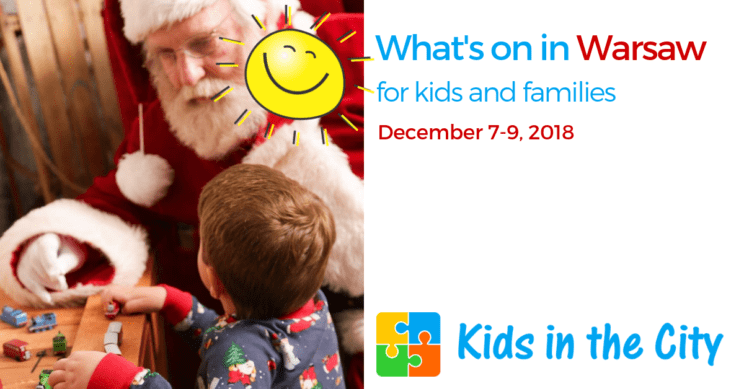 Attractions include meeting with Santa, Christmas songs, arts and crafts workshop (decorating bombki – Christmas tree ornaments), face painting, Lego zones (Duplo, Technic, Classic). Facebook event in Polish. Location: Royal Wilanów Shopping Center (reception area D, level 1+), Klimczaka 1 Street, free entrance, 11 am – 3 pm. Attractions for children include meeting with Santa, arts & crafts workshops, games, theater for children (at 11 am). Facebook event in Polish. Location: Fundacja Sto Pociech, Freta 20/24A Street (Old Town), 4.30 pm, online tickets – 20 PLN. Facebook event in Polish. Location: Łowicka Cultural Center (Centrum Łowicka), Łowicka 21 Street (Mokotów). 11 am – 12 pm. Facebook event in Polish. Location: Saska Kępa Cultural Center “PROM”, Brukselska 23 Street, 10.30 am – 12 pm. Online tickets (20 PLN – family ticket for up to 4 participants). Facebook event in Polish. Location: Dorożkarnia Cultural Center, Siekierkowska 28 Street (Mokotów), click here to register and buy tickets (30 PLN), 10 am -11.30 am. Facebook event in Polish. Location: Sports Center in Nowy Dwór Mazowiecki, Sportowa 66 Street, 05-100 Nowy Dwór Mazowiecki, free entrance, 9 am – 5 pm. Facebook event in Polish. The event runs also on Sunday. Location: Museum of Asia and the Pacific (Muzeum Azji i Pacyfiku), Solec 24A Street (Powiśle), 11 am – 6 pm. Oriental handicraft, sweets, coffee and tea from the Middle and the Far East, ceramics, decorative fabrics, jewelry, shawls, oriental cosmetics, food products from India, Sri Lanka, Nepal, China, Japan, Turkey, Lebanon, Palestine, Iran, Afghanistan, and Morocco. Facebook event in Polish. Click here to read our tips in English on visiting the Museum. Location: Hala Gwardii, Plac Żelaznej Bramy 1 (city center), free entrance, 9 am – 5 pm. Facebook event in Polish. The fair runs also on Sunday. Location: Mińska 65 Street (Praga). Opening hours: 11 am – 7 pm. Over 300 brands, original clothes and accessories, unique design, crafts, ecological cosmetics, children’s items, slow food court. Facebook event in Polish. The fair runs also on Sunday. Location: Dom Towarowy Bracia Jabłkowscy shopping center, Bracka 25 Street (city center), 11 am – 7 pm, tickets 10 PLN. Over 200 exhibitors of furniture, graphics, ceramics, and textiles. During December edition, on the second floor a special gift zone with eco-friendly gifts, delicacies, cosmetics, and jewelry. Facebook event in Polish. The fair runs also on Sunday. Location: Wilanów Palace, Stanisława Kostki Potockiego 10/16 Street, 12 pm – 1.30 pm. Online tickets (regular tickets 20 PLN, reduced tickets 15 PLN). Meeting point – a cloakroom in the Palace. More in English. Facebook event in English. In December, there is only one Sunday trading ban: December 9. 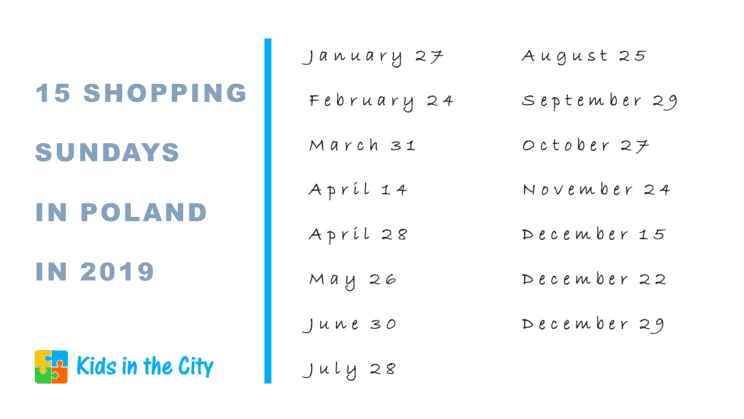 December 16, 23, and 30 are shopping Sundays. Trade ban does NOT include cinemas, restaurants, cafés, small local stores where the owner can work, stores at gas stations, flower shops, pharmacies. Shopping malls can be open but most of the stores inside will be closed (only cinemas, restaurants, pharmacies in shopping malls can be open). You can always do basic shopping at the gas stations (24/7). Location: Intercontinental Hotel, Emilii Plater 49 Street (city center), 12 pm. 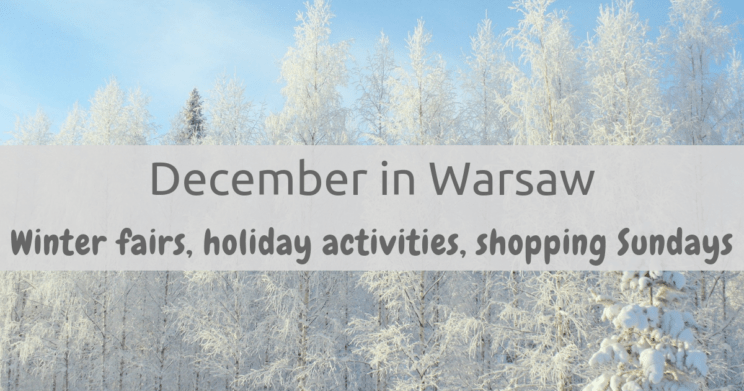 ‘International Friends of Warsaw’ (a multi-national social group of individuals and families from around the world living in Warsaw) invites for a Christmas Party packed with attractions for children (games and activities for kids, Santa, live music, raffles, buffet brunch), open to non-members. Tickets and more info: ifwarsaw@gmail.com. More in English about ‘International Friends of Warsaw’. Location: Skwer Dywizji Pancernej (the area between the Old Town and Vistula), free entrance. Starting from December 8, the holiday illuminations at the Fountain Park will be on every day from 3 pm. 15-minutes shows with music: 4 pm, 5 pm, 6 pm. More in English. Location: Arena Ursynów, Pileckiego 122 Street. Free entrance, 11 am – 4 pm. Attractions for children include meeting with Santa, building Lego, Lego games, sports contests, theater for children. Facebook event in Polish. Location: Stegny ice skating rink, Inspektowa 1 Street (Mokotów), 3 pm – 5 pm, free entrance. Attractions include figure skating show, contests, Santa on ice. Facebook event in Polish. Location: Plac / Square Europejski (Wola), 4 pm – 9 pm, free entrance. Attractions include a Venetian carousel, winter train for children, games with the Snow Queen, food trucks. Facebook event in Polish. The event runs also on Saturday. Click here to read more about ice skating rinks in Warsaw. Location: Wilanów Palace Garden, Stanisława Kostki Potockiego 10/16 Street, 11 am – 12.30 pm, meeting point at the ticket office (small yellow building). Click here to buy tickets online (10 PLN, you do not need to print your tickets if you have a smartphone). In December: ‘A winter meeting with the birds’. Click here to read more in English. Facebook event in English. Location: Warsaw Railway Museum (Stacja Muzeum), Towarowa 3 Street (Wola), 10 am – 2 pm (the Museum is open on Sundays 9 am – 5 pm). A chance to buy model railways and trains and meet railway modeling enthusiasts. During the event reduced tickets for everyone (6 PLN, children up to 7 free entrance). The Museum website in English. Facebook event in Polish. Location: Śródmieście Cultural Center (Dom Kultury Śródmieście), Smolna 9 Street (city center), 11 am – 1 pm, online tickets (15 PLN). Facebook event in Polish. Location: Scena SPATiF, Aleje Ujazdowskie 45 Street (city center), 4 pm – 5 pm. Click here to buy tickets (family ticket for 3 people 50 PLN). Facebook event in Polish. Location: ALTO shopping center, Al. Rzeczypospolitej 14 (Wilanów), 12 pm – 6 pm, free entrance. Attractions include meeting with Santa, dancing show, arts and crafts workshops, igloo construction, snowball fight, magic show, face painting. Facebook event in Polish. Location: Wilanów Cultural Center, Kolegiacka 3 Street. 12.45 pm – 2 pm. You can buy tickets (adults 10 PLN, children 5 PLN) at the reception desk of the Wilanów Cultural Center. Facebook event in Polish. Location: Piaseczno market square, pl. Piłsudskiego, free entrance, 11 am – 5 pm. Attractions include Santa’s grotto, baking gingerbread with Mrs. Claus, arts and crafts workshop (Christmas ornaments and cards), concerts, at 4 pm – the Christmas tree lighting. Facebook event in Polish. Location: Sports Center in Nowy Dwór Mazowiecki, Sportowa 66 Street, 05-100 Nowy Dwór Mazowiecki, free entrance, 9 am – 5 pm. Facebook event in Polish. The event runs also on Saturday. Location: Marriott Hotel, al. Jerozolimskie 65/79 Street. Opening hours: 10 am – 5 pm, 10 PLN entrance tickets. Gifts and foods from around the world. The Bazaar is organized by SHOM (The Spouses of Heads of Missions) to raise funds for those less fortunate in Poland. Facebook event in Polish. Location: Hala Gwardii, Plac Żelaznej Bramy 1 (city center), free entrance, 9 am – 5 pm. Facebook event in Polish. The fair runs also on Saturday. Location: Mińska 65 Street (Praga). Opening hours: 11 am – 7 pm. Over 300 brands, original clothes and accessories, unique design, crafts, ecological cosmetics, children’s items, slow food court. Facebook event in Polish. The fair runs also on Saturday. Location: Dom Towarowy Bracia Jabłkowscy shopping center, Bracka 25 Street (city center), 11 am – 7 pm, tickets 10 PLN. Over 200 exhibitors of furniture, graphics, ceramics, and textiles. During December edition, on the second floor a special gift zone with eco-friendly gifts, delicacies, cosmetics, and jewelry. Facebook event in Polish. The fair runs also on Saturday. Location: Botanical Garden in Powsin, Prawdziwka 2 Street, 02-973 Powsin. Opening hours: 10 am – 5 pm. A chance to buy gifts, workshops, theater for children. Facebook event in Polish. Location: Warsaw Old Town, the Warsaw Barbican area, next to the Castel Square (Plac Zamkowy), 11 am – 8 pm. Souvenirs, gifts, local crafts and food like pierogi, hot chocolate or… ice-cream. Facebook event in Polish. The Market runs until January 6, 2018. As a parent your free time is precious, and Kids in the City wants to help you make the most of it. Every Thursday you’ll receive a hand-picked selection of family-friendly activities in Warsaw for the upcoming weekend. Our emails could be caught in a spam filter. Please check your junk/spam folder. And add our address (magda@kidsinthecity.pl) to your Safe Senders List, Address Book or Contact List. If you use a Gmail account, there’s a chance the newsletters may be placed in Gmail’s Promotions tab. Please add magda@kidsinthecity.pl to your contacts list to ensure our future emails are placed in the Primary tab.